KIM Kardashian and Kanye West took their daughter to the museum in New York yesterday to celebrate her first birthday and Father's Day. The couple, who got married last month in Florence, Italy, spent the day at the Children's Museum of Manhattan in New York, exploring five floors of literature, science, media and art to mark the tiny tot's first milestone and to celebrate Father's Day. 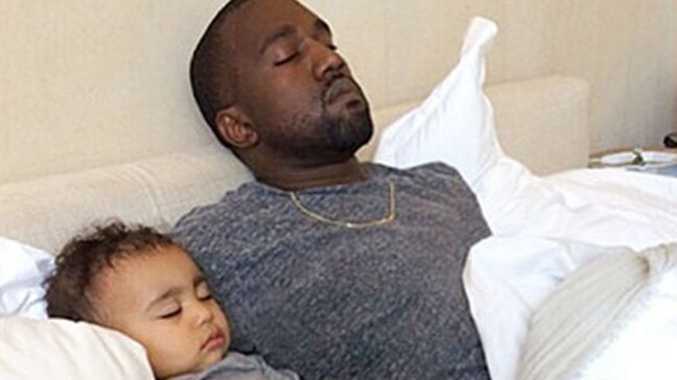 However, it seems the educational visit was too much for the baby as Kim later shared a photograph on her Instagram account of North and Kanye, 37, fast asleep in bed, wearing matching outfits. She accompanied the adorable snap with the caption: "This is what life is about! Our baby girl turned 1 today! We played so hard they passed out while we were watching the game! Happy Father's Day to the best daddy in the world! The way you love our daughter and protect her makes me filled with so much love! #BestDayEver #Twins #HappyFathersDay #HappyBirthday (sic)." Meanwhile, Kim and Kanye have decided to postpone North's birthday party until next weekend, so that both of their families can fly to Los Angeles for the lavish event. A source said last week: "They are throwing her a big party next weekend and Kourtney [Kardashian], Khloé Kardashian and [Kourtney's] kids are coming home for it."